As CinemaCon continues throughout the week, all the big studios are planning massive events to showcase their upcoming movies. Warner Bros. has a two hour event scheduled for tomorrow, and Universal is doing an unprecedented four hours. Not Disney. No. The biggest studio around right now spent literally twelve and half minutes on their presentation before diving into the meat of their big show, which was a screening of Pirates of the Caribbean: Dead Men Tell No Tales in full. The biggest news to come out of their short, but sweet dog and pony show was the title reveal for Wreck-It-Ralph 2. The full title is officially Ralph Breaks the Internet: Wreck-It Ralph 2. Along with the title, we also have a logo to show off, and the full press release that was shared by Disney. You can read the full thing here: Wreck-It Ralph is escaping out of his arcade and into the expansive universe of the internet next year when Ralph Breaks the Internet: Wreck-It Ralph 2 hits the big screen. Dave Hollis, head of distribution for The Walt Disney Studios, revealed the much-anticipated sequel's title and told CinemaCon attendees that Jane Lynch and Jack McBrayer would be returning to the roster. Also returning are the team behind the original Wreck-It Ralph, who won an Oscar last month for Walt Disney Animation Studios' billion-dollar-box-office-blockbuster Zootopia. Directors Rich Moore (Zootopia, Wreck-It Ralph, The Simpsons) and Phil Johnston (writer, Wreck-It Ralph, Zootopia, Cedar Rapids), and producer Clark Spencer (Zootopia, Wreck-It Ralph, Bolt) are hard at work on the movie. Said Moore. "To take these characters we love and have them enter the enormous world of the internet has given us so much to explore. Our production team has been hard at work designing a world that takes something we all think we know, the internet, but shows it in a whole new, imaginative way." "We're so excited to be working with Ralph, Vanellope von Schweetz, Fix-It Felix and Sergeant Calhoun again, and we have new characters we look forward to unveiling. At the center of this film, as in the first one, is the relationship between Ralph and Vanellope, two once-outcasts, who in each other, found true friendship." When Wreck-It Ralph opened on Nov. 2, 2012, it turned in the highest opening weekend ever for a Walt Disney Animation Studios film at the time of release. 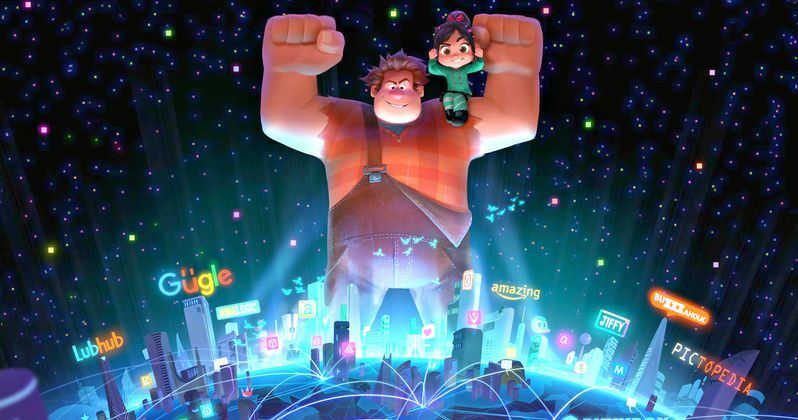 Nominated for an Oscar and Golden Globe for best animated feature, "Wreck-It Ralph" won the PGA Award for outstanding producer of an animated theatrical motion picture as well as five Annie Awards, including best animated feature, director, cast and screenplay. The film was named best animated feature by the Broadcast Film Critics Association, earned outstanding achievement in casting for an animated feature by the Casting Society of America, and won the Kids' Choice Award for favorite animated movie. Ralph Breaks the Internet: Wreck-It Ralph 2 hits U.S. theaters on March 9, 2018. Take a look at the official logo courtesy of Disney.